TAMPA, Fla. – April 18, 2016 – The Forensic Training Academy, announced today that they are hosting Summer Training Institute 2016 at John Jay College of Criminal Justice June 13 – 17, 2016. Attendees will participate in in-person workshops with internationally renowned experts in the forensic mental health field. 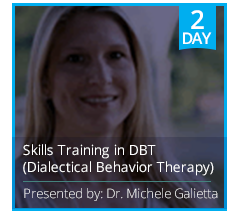 One of our new training programs is a 2-day workshop presented by Dr. Michele Galietta on Skills Training in DBT (Dialectical Behavior Therapy). Dr. Galietta is a researcher and clinician specializing in the application, adaptation and dissemination of empirically-supported treatments. Her areas of clinical expertise include the assessment and treatment of violence, self-harm, and suicide across the lifespan. Or the last decade she has been studying the assessment and treatment of stalking and interpersonal violence. For the last 15 years, she has developed specialized behavioral treatment programs in a variety of settings. Dialectical Behavior Therapy (DBT) is a comprehensive cognitive behavioral treatment that is increasingly being used in forensic settings. Comprehensive DBT has been found to have great practical utility for the reduction of violence and self-harm. DBT Skills are an essential component of comprehensive DBT and some evidence suggests that skills alone, with case management may efficacious for less acute individuals as well. The primary focus of this two-day workshop will be the content and delivery of the skills component of DBT with emphasis on relevant adaptations for forensic clients (e.g., substance abuse, skills for reducing violence & obsessional thinking). – To describe standard DBT skills: mindfulness, distress tolerance, emotional regulation, and interpersonal effectiveness. – To describe specific DBT skills adaptations for individuals in forensic/correctional settings. – To understand how to structure and run DBT skills groups in forensic/correctional settings. – To practice specific DBT skills in each of the skills domains.